The research institution will display new tech that will revolutionise connectivity as well as road safety. 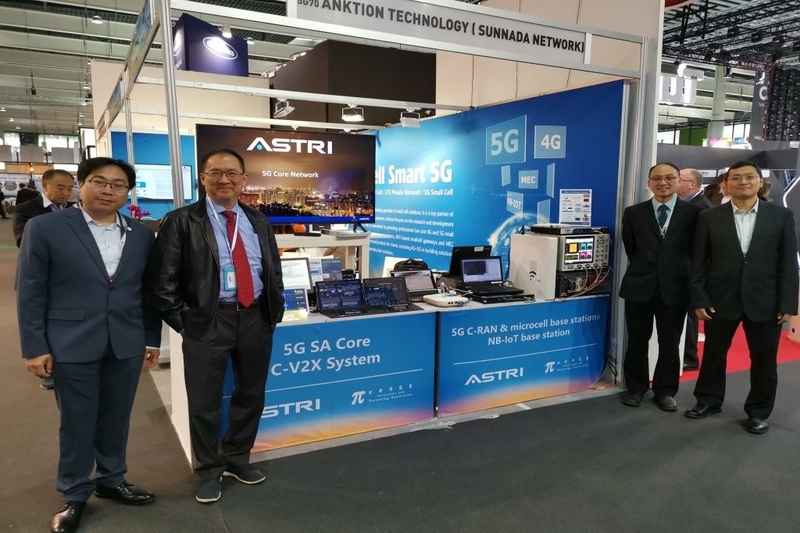 According to a recent press release, ASTRI is showcasing a series of its latest 5G communications technologies at the Mobile World Congress Barcelona 2019 (25-28 February 2019). The institute is collaborating with various big and smaller technology corporations. ASTRI is performing joint technology demonstrations/showcases at multiple partners’ booths. The theme of this year’s event is ‘Intelligent Connectivity’ – the term which uses to describe the powerful combination of flexible, high-speed 5G networks, the Internet of Things (IoT), artificial intelligence (AI) and big data. ASTRI’s 5G micro cell provides a low-power and cost-efficient solution that uses NXP LX2160A ARM processors. The solution includes ASTRI’s ARM-based 5G physical layer software. ASTRI also realises CU-DU splitting with data path acceleration on LX2160A to support high throughput non-standalone (NSA) deployment. The first demonstration showcases ASTRI’s 5G micro cell ARM-based physical layer. The solution can also be connected to a 5G CPRI RRU with a PCIe-CPRI conversion card. Keysight DSAV334A Infiniium V-Series Oscilloscope and 89600 VSA software for 5G NR modulation analysis will be used to demodulate and verify the four-layer 256QAM 5G NR standard-compliant signal. The second demonstration showcases ASTRI’s NSA micro cell with CU-DU splitting architecture. ASTRI has integrated NSA Central Unit (CU) on NXP LX2160A with data path acceleration. The CU connects to 4G and 5G Distributed Units (DUs) with up to 2 Gbps eMBB (enhanced Mobile Broadband) throughput for 5G traffic. ASTRI’s 5G C-RAN base station includes the L1 design based on the Xeon processor by a multinational telecom equipment firm. With ASTRI’s leading L1 design, the 5G C-RAN base station supports up to 2 Gbps throughput. The total solution offers a completely flexible and scalable 5G sub-6GHz base station reference design for Original Equipment Manufacturers (OEM) and Network Equipment Providers (NEP) for developing commercial-grade products – enabling them to effectively seize market opportunities. ASTRI’s NB-IoT base station solution is powered by its NB-IoT L1 software. The software is based on a cost-efficient and low-power System-on-Chip (SoC). The solution has been integrated with an L2/3 protocol stack and an Operations Management and Maintenance (OAM) system to provide a complete NB-IoT base station reference design. The on-site demonstration includes the integration of ASTRI’s NB-IoT base station with a commercial NB-IoT EPC as well as NB-IoT dongles to support the end-to-end network NB data streaming. 5G Core Network provides the essential flexibility to support different 5G applications and scenarios. ASTRI is performing a live demonstration of its 5G Standalone (SA) Core on Intel x86 server. ASTRI’s 5G SA core complies with the new network architecture in 3GPP release 15 standards, with new capabilities of Control User Plane Separation (CUPS), Distributed User Plane (UPF), Service-based Architecture (SBA) support and flow-based QoS. ASTRI’s 5G SA core can scale up to 200Gbps on a single x86 server. It supports cloud-native deployment with containers support, cloud-scale load balancing and scaling, log/metrics/alarms management as well as visualisation. C-V2X technology plays a key role in facilitating interactions between vehicles, road users, and roadside infrastructure – enabling smart mobility applications. ASTRI will demonstrate its C-V2X Software System that leverages capabilities such as rapid object recognition (e.g. pedestrians) and traffic situation detection. Using C-V2X technology, the system can detect imminent danger on roads, and issue real-time alerts like pedestrian crossing to drivers. To minimise the latency, the video analysis algorithm is executed on ASTRI’s C-V2X Edge system, and the results are communicated between multiple C-V2X Road Side Units (RSUs) through direct Vehicle-to-Infrastructure (V2I) communications. This technology enhances road safety and traffic management and brings significant benefits to road users and ordinary residents. By being at the ASTRI is helping to push Hong Kong’s smart city agenda; not just by displaying the tech itself but in the potential connections and network expansions it may secure. The Smart City Blueprint for Hong Kong notes that the aim is to create and sustain a Smart Economy; i.e., Hong Kong is working to position itself as a viable and attractive location to fully develop innovative business ideas and become a preferred location for consideration of technology investment. Looking ahead, the region seeks to enhance the overall business climate, particularly in areas of the technology-driven economy like Fintech and re-industrialisation, and further develop our I&T ecosystem to attract more start-ups and investors from other jurisdictions.